ElasticSpace Studio |2004 (MArch, Faculty of Architecture, University of Sydney). 15 weeks design project. Space in its morphological form is described by 6 adjacent surfaces, which enclose a volume.In the configuration of a dwelling (four walls, foundation, roof), space separates the vulnerable human body from whatever disturbing influences. Similar to clothing as a second skin, the house has become an extension of man, a skin of larger scale: Architecture can be understood as yet another layer of protective skin: only the distance between the layers defines the distinction between a clothing and a wall. The correspondence to this skin defines the use of habitation. What is the character of this skin? And what is the space it generates? Of which nature is the correspondence between functional and spatial proposals? The ElasticSpace Studio examines the generative processes of space/volume, and follows the appropriation in contemporary fashion culture, art production and it’s relatives in architecture, to identify the interdependencies between form, function and potential variables of use. The research focuses on two major characteristics: the texture and quality of any enveloping surface as an extended skin of man (clothes, wall, space), and the distance and movement range of any of these skins to the human body. 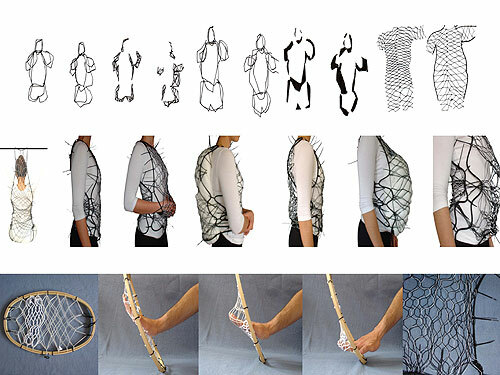 The ElasticSpace Studio will review possible conditions for an operation of architecture as a third skin: the pattern charts as a planning device of surface, the interstitial space as the distance between body and envelope, the programmed surfaces as an inhabitable space generating environment. On search fort he paradigm of elasticity as a flexible, moving, transforming architectural space.